1 ml contains 40 IU of insulin human. 1 vial contains 10 ml equivalent to 400 IU. One IU (International Unit) corresponds to 0.035 mg of anhydrous human insulin. 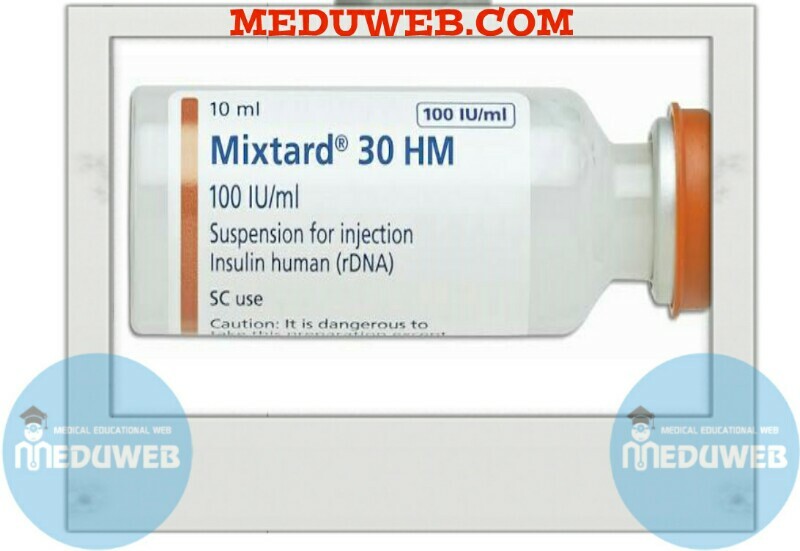 Mixtard· is a mixture of dissolved insulin and isophane (NPH) insulin. Mixtard” 30 consists of 30% dissolved insulin and 70% isophane insulin. Suspension for injection in vial. Mixtard” is a dual-acting insulin. It is a biphasic formulation containing both fast-acting and long-acting insulin. Premixed insulin products are usually given once or twice daily when a rapid Initial effect together with a more prolonged effect is desired. obesity) and lower in patients with residual, endogenous insulin production. An injection should be followed within 30 minutes by a meal or snack containing carbohydrates. Concomitant illness, especially infections and feverish conditions, usually increases the patient’s insulin requirement. Concomitant diseases in the kidney, liver or affecting the adrenal. pituitary or thyroid gland can require changes in the insulin dose. Adjustment of dosage may also be necessary if patients change physical activity or their usual diet. Dosage adjustment may be necessary when transferring patients from one insulin preparation to another. For subcutaneous use. Insulin suspensions are never to be administered intravenously. Mixtard· is administered subcutaneously in the thigh or abdominal wall. If convenient, the gluteal region or the Subcutaneous injection into the abdominal wall ensures a faster absorption than from other injection sites. Injection into a lifted skin fold minimises the risk of unintended intramuscular injection. The needle should be kept under the skin for at least 6 seconds to make sure the entire dose is injected. Injection sites should always be rotated within the same region in order to reduce the risK of lipodystrophy. Mixtard” vials are for use with insulin syringes with a corresponding unit scale. Mixtard· is accompanied by a package leaflet with detailed instructions for use to be followed. Hypersensitivity to the active substance or to any of the exopients. over a period of hours or days. They include thirst, increased frequency. of urination, nausea, vomiting, drowsiness, flushed dry skin, dry mouth, loss of appetite as well as acetone odour of breath. Hypoglycaemia may occur if the insulin dose is too high In relation to the Insulin requirement. Omission of a meal or unplanned, strenuous physical exercise may lead to hypoglycaemia. Patients, whose blood glucose control is greatly Improved e.g. by Intensified insulin therapy, may experience a change In their usual warning symptoms of hypoglycaemia and should be aovised accordingly. Usual warning symptoms may disappear in patients With longstanding diabetes. Transferring a patient to another type or brand of Insulin should be done under strict medical supervision. 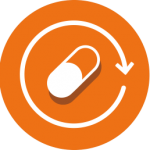 Changes in strength, brand (manufacturer), type, origin (human insulin, insulin analogue) and/or method of manufacture may result In a need for a change in dosage. Patients transferred to Mixtard” from another type of Insulin may require an increased number of daily injections or change in dosage from that used with their usual Insulin products. If an adjustment is needed when switching the patient to Mixtard”, it may occur With the first dose or during the first few weeks or months.As with any insulin therapy, injection site reactions may occur and include pain, redness, hives, inflammation, bruising, swelling and itching. Continuous rotation of the injection site within a given area may help to reduce or prevent these reactions. Reactions usually resolve in a few days to a few weeks. On rare occasions, injection site reactions may require discontinuation of Mixtard”, Before travelling between different time zones, the patient should be advised to consult the physician, since this may mean that the patient has to take insulin and meals at different times. Insulin suspensions are not to be used in insulin infusion pumps. thiazolidinediones and insulin medicinal products is considered. If the combination is used, patients should be observed for signs and symptoms of congestive heart failure, weight gain and oedema. Thiazolidinediones should be discontinued if any deterioration in cardiac occurs. Oral a ti-diabetic products, monoamine oxidase inhibitors (MAO I), non-selective beta-blocking agents, angiotensin converting enzyme (ACE) inhibitors, salicylates, anabolic steroids and sulphonamides. Oral contraceptives, thiazides, glucocorticoids, thyroid hormones, sympathomimetics, growth hormone and danazol Beta-blocking agents may mask the symptoms of hypoglycaemia and delay recovery from hypoglycaemia. Octreotide/lanreotide may either increase or decrease the insulin requirement. Alcohol may intensify or reduce the hypoglycaemic effect of insulin. pregnant women with diabetes are recommended throughout pregnancy and when contemplating pregnancy. Insulin requirements usually fall in the first trimester and increase subsequently during the second and third trimesters. After delivery, insulin requirements normally return rapidly to pre-pregnancy values. breast-feeding. Insulin treatment of the nursing mother presents no risk to the baby. However, the Mixtard” dosage, diet or both may need to be adjusted. episodes of hypoglycaemia. The advisability of driving should be considered in these circumstances. The most frequently reported adverse reaction during treatment is hypoglycaemia. patient population, dose regimens and level of glycaemic control, please see section c below. reactions (pain, edness, hives, inflammation , bruising;-swelling and itching at the injection site) may occur. very rare « 1/10,000); not known (cannot be estimated Jrorn the available data). The occurrence of generalised hypersensitivity reactions (including generalised skin rash, itching, sweating, gastrointestinal upset, angioneurotic oedema, difficulties in breathing, palpitation, reduction in blood pressure and faintinglloss of consciousness) is very rare but can potentially be life threatening. drowsiness, excessive hunger, vision changes, headache, nausea and palpitation. Lipodystrophy is reported as uncommon. Lipodystrophy may occur at the injection site. – Mild hypoglycaemic episodes can be treated by oral administration of glucose or sugary products. It is therefore recommended that the diabetic patient always carries sugar containing products. must be given intravenously, if the patient does not respond to glucagon within 10 to 15 minutes. Upon regaining consciousness, administration of an oral carbohydrate is recommended for the patient in order to prevent a relapse. Pharmacotherapeutic group: Drugs used in diabetes. Insulins and analogues for injection, intermediate-acting combined with fast-acting, insulin (human). ATC code: A10AD01. The blood glucose lowering effect of insulin is due to the facilitated uptake of glucose following binding of insulin to receptors on muscle and fat cells and to the simultaneous inhibition of glucose output from the liver. Mixtard~ is a dual-acting insulin. Onset of action is within y, hour, reaches a maximum effect within 2 – 8 hours and the entire crutation of action is up to 24 hours. This process is influenced by several factors (e.g. insulin dosage, injection route and site, thickness of subcutaneous fat, type of diabetes). The pharmacokinetics of insulin products are therefore affected by significant intra- and inter-individual variation. of the fast-acting insulin is reached within 1.5 – 2.5 hours after subcutaneous administration. Human insulin is reported to be degraded by insulin protease or insulin-degrading enzymes and possibly grotein disulfideisomerase. A number of cleavage (hydrolysis) sites on the human insulin molecule have been proposed; none of the metabolites formed following the cleavage are active. insulin from plasma (insulin in the blood stream – has a ty, of a few minutes). Trials have indicated a ty, of about 5 – 10 hours. Non-clinical data reveal no special hazard for humans based on conventional studies of safety pharmacology, repeated dose toxlcity, genotoxicity, carcinogenic potential, toxicrty to reproduction. Zinc chloride, glycerol, metacresol, phenol, disodium phosphate dihydrate, sodium hydroxide/hydrochloric acid (for pH adjustment), protamine sulphate and water for injections. (bromobutyVpolyisoprene) rubber and a protective tamper-proof. plastic cap in a carton. Pack sizes of 1 and 5 vials. Not all pack sizes may be marketed. Insulin preparations which have been frozen must not be used. recommended to allow the vial to reach room temperature before resuspending the insulin as instructed for first ume use. Insulin suspensions should not be used if they do not appear uniformly white and cloudy after resuspension.